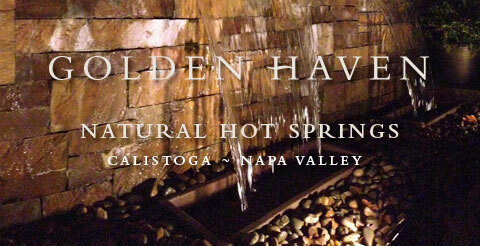 Golden Haven Hot Springs Spa and Resort is located in Calistoga, nestled in the heart of the Napa Valley wine country. Come and experience the healing magic of Golden Haven's pure natural hot springs mineral water for the perfect Calistoga spa getaway—whether you are coming just for the day or staying with us overnight. Hot Springs Water is used throughout the spa and comes from the geothermal aquifer that runs underneath our spa. The hot springs water emerges from the earth at about 150 degrees and is cooled for use. Feel your stress float away as you relax in our hot springs mineral pools. Mud Baths in Calistoga have a long history. Long before the first European settlers, the local Wappo Indians used this area as a place of healing and called it Coo-lay-no-maock, “the oven place”. We use the hot springs water in the mud bath, and our couples mud bath is our most requested treatment—and by “couple” we mean any two people who want to share the experience. Massages and Herbal Facials will complete your all-natural spa experience. We feature a wide choice of spa packages that combine a mud bath or herbal mineral bath with a massage and/or natural herbal facial. Accommodations at Golden Haven are both comfortable and affordable. We have 28 rooms, some featuring your own hot springs jacuzzi. Others have two bedrooms and are perfect for larger groups, and others have saunas. Grounds at Golden Haven include an extensive recreation and picnic area. You can play Bocce, enjoy a picnic lunch, borrow one of our bikes, chill-out in front of our fire pit, or just relax and take in the California sun.